Accounting | Leah Palmer Preiss ~ Curious Art: Acrylic painting on text collage on canvas, 6"x6"
Year of the (Counting) Sheep Acrylic painting on text collage on canvas, 6"x6"
2015 is the year of the sheep according to Chinese astrology– most say it doesn’t start until the Chinese lunar new year (the 19th) but others insist it begins today, on the solar new year. Happy new year whenever & however you choose to celebrate! The figures on these particular papers, however, are years of the sheep past, present & future. And you may notice that the fat stacks of 100′s are also strangely sheep-centric (& in no way representative of my own cash flow, alas)! The background text was scanned from an antique 8th-grade textbook, Iroquois Arithmetics. 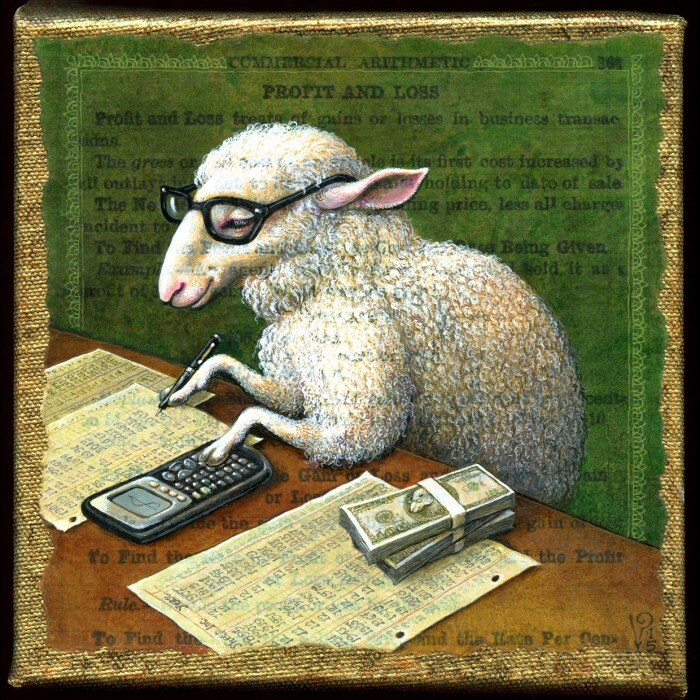 This entry was posted in Art, Paintings, Prints Available and tagged Accounting, Acrylic, Animals, Mathematics, Painting, Sheep, Tax, Year of the Sheep on 4February 2015 by Leah.